My Epson XP-830 started dropping black ink globs on my prints, which would smudge and wreck photos. 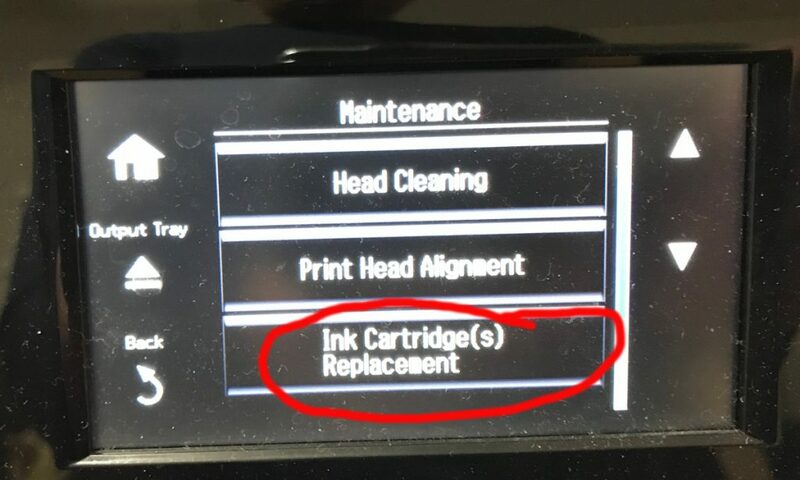 As I had recently installed $150 worth of ink, I didn’t want to just go out and get a new printer. I also liked the compact format of this printer, and wouldn’t just buy the same one, as this was starting to look like a doorstop after its 2nd set of cartridges. I wasn’t concerned about breaking the printer at this point, because I was ready to throw it out. I managed to resolve the issue – I’ve decided to write about what I did, and perhaps some will find this article and I’ll save a few printers from an early trip to the landfill. I expect this will work for any Epson XP printer. First, I ordered a print head cleaning kit from Amazon (kit, Amazon link). In hindsight, I don’t actually think this was an issue with my print heads, but I did a number of things all at once, so I don’t know exactly which step resolved my issue. I recommend watching their video before ordering the kit. The first step was getting the print head out of its right-side dock. 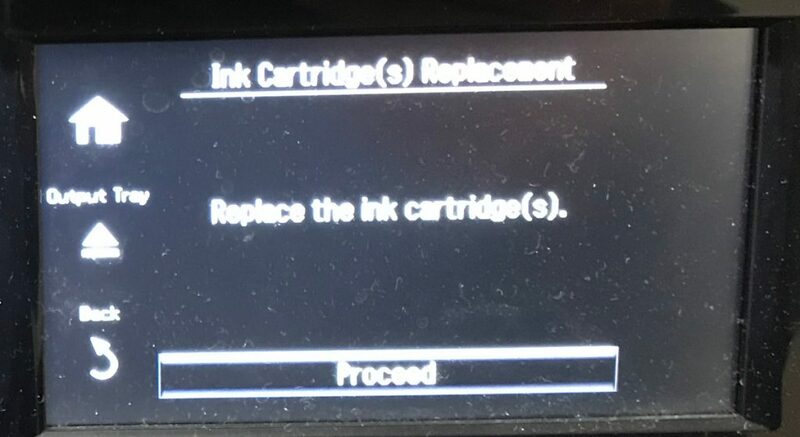 Go to the menu, click maintenance, and then click Ink Cartridge Replacement. 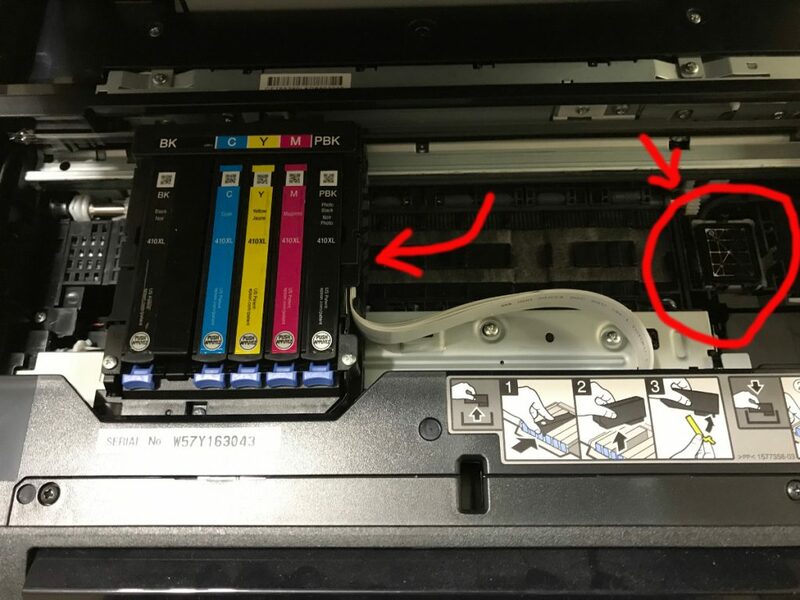 At this point, the print head will have moved to its change cartridge position. Disconnect the power. At this point, I took out the cartridges, and I wrapped them in plastic wrap, following the guidance of the Print Head Hospital. I did clean the heads, as instructed in the Print Head Hospital video, but I think what really made the difference for the black ink globs was the following: using cheap papertowels and cardstock, I cleaned up all the ink in the areas highlighted by arrows in the above image. I cleaned under the print head by cutting a ~1″ piece of cardstock, wrapping it with a paper towel, and running it underneath the assembly as shown at the 3:40 mark in the Print Head Hospital video, and repeated until the paper towel would come out clean. I plugged the printer back in, re-installed the cartridges, ran the regular print head cleaning cycle 3 times (until the test page came out fine), and am now getting perfect prints. Good luck – hope this helps. Previous PostFix a worn out Toronto Public Library cardNext PostMicrosoft revokes digital media. Again.